Seventeen sport management graduate students in Gina Pauline’s advanced sport event management course have spent the spring semester, in collaboration with the Syracuse Sports Corp., laying the foundation to not only produce the Second Annual Syracuse Sport Summit taking place Thursday, April 30, but also to explore the possibility of bringing a multi-sport statewide competition for athletes with physical disabilities—including wounded military veterans—to Syracuse. On April 30, the students will showcase their efforts and dedication to adaptive sports. The summit aims to spark discussion about the integration of disabled citizens into the community through the use of adaptive sports. It also looks to explore the areas of need for such an event as well as the benefits to community members, athletes and adapted sport. During the Syracuse Sport Summit, the students will present their vision for the statewide competition in an effort to build discussion. The 2015 Syracuse Sport Summit begins with remarks by Syracuse Sports Corp. President Michelle Evanson and Mike Haynie, vice chancellor for Veteran & Military Affairs at Syracuse University. Cicero resident George Lonergan will share personal perspectives related to adaptive sport, which for he and his family began in December of 2013 when he was in a snowmobile accident in Old Forge, N.Y. The accident left him unable to walk without the use of prosthetic legs. Earlier this year, he started running again with the use of his prosthetic running legs. A presentation from the sport management graduate students will reveal logistical findings and suggestions for the possibility of the Syracuse area hosting the statewide summer athletic competition to include sports such as track and field, judo, power lifting, swimming, wheelchair basketball, bocce and goalball, among many others. Attendees will then expand on these findings with suggestions of their own to shape a proposal for the competition that will be developed later this summer. “The students have gained tremendous experience not only in event planning but also in adaptive sport, an area they had never been exposed to before this project. In doing so, they are learning about the sports, rules and regulations as well as necessary facilities, funding opportunities and other aspects. 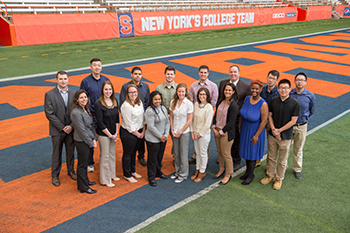 The impact this project has left on each and every one of them professionally and personally is tremendous,” says Pauline, associate professor of sport management. John Register, associate director for community and veterans programs for U.S. Paralympics, a division of the United States Olympic Committee (USOC), will share insights on how he has worked to advance the Paralympic Movement by leading programming efforts for service members and veterans with physical disabilities. He will also talk about his personal experiences of adapted sport. Register is a two-time Paralympic athlete and silver medalist, a four-time All-American track and field athlete and U.S. Army Gulf War veteran. 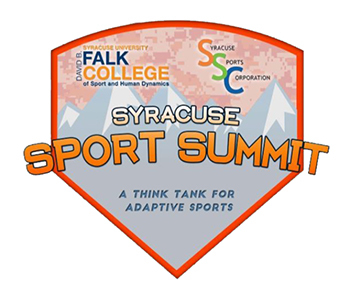 The 2015 Syracuse Sport Summit will include three breakout sessions to facilitate discussion among an anticipated 150 attendees that will include experts and professionals from the adaptive sports community, military veteran community, sports and event management industries, and local government. The breakout sessions in the areas of adaptive sports, event management and facility operations will feature speakers who specialize in each topic, including: Michele Evanson; Rebecca Hann, associate vice president of operations at Onondaga Community College; John Register; and Brian McLane, strategic advisor for disabilities and inclusion at Syracuse University. Julie O’Neill, team leader of sport performance for the United States Olympic Committee will present the keynote address. In her role with the USOC, she oversees the high-performance planning process and sport development projects for five internally managed Paralympic sports, including track and field, cycling, swimming, and alpine and Nordic skiing. Registration for the 2015 Syracuse Sport Summit is set at $35 and can be completed at http://syracusesportsummit.wordpress.com. For more information, contact Pauline at 315-443-9881 or email syracusesportsummit@gmail.com. Bracketology: Is it a Science or an Art?